India today issued a strong demarche to Palestine on the issue of the presence of its ambassador to Pakistan at an event of JuD chief Hafiz Saeed, terming it as "unacceptable". 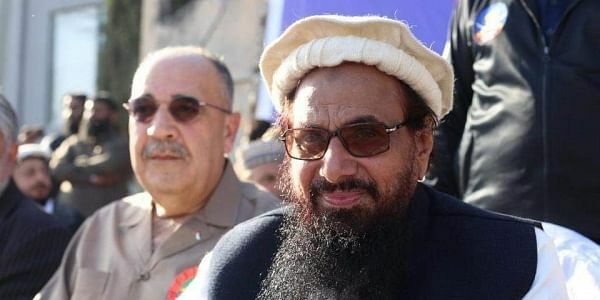 NEW DELHI: India today issued a strong demarche to Palestine on the issue of the presence of its ambassador to Pakistan at an event of JuD chief and Mumbai terror attack mastermind Hafiz Saeed, terming it as "unacceptable". India's Secretary (economic relations) Vijay Gokhale in the external affairs ministry called Palestinian ambassador here Adnan Abu Al Haija to the South Block after which the ministry said, "the concerns were conveyed both in New Delhi to the Palestinian Ambassador and in Ramallah to the Minister of Foreign Affairs and Expatriates, State of Palestine." "Government of India has strongly conveyed to the Palestinian side that the Palestinian Ambassador in Pakistan's association with terrorist Saeed, who is proscribed by the United Nations, at an event in Rawalpindi on 29.12.2017, is unacceptable," the ministry said in a release. It said the Palestinian side has conveyed "deep regrets" over the incident and assured India that they are taking serious cognisance of their ambassador's presence at this event. "They have said they will deal with this matter appropriately. It was also conveyed that Palestine highly values its relationship with India and stands with us in the war against terrorism, and will not engage with those who commit acts of terror against India," it said. The government took note of the assurances given by the Palestine envoy, who informed India that his government had decided to recall its Ambassador to Pakistan Walid Abu Ali. Talking to PTI after his meeting, Haija said Ali has been recalled for attending the rally organised by Saeed. Asserting that Ali's action was not "acceptable" given the close and friendly ties between India and Palestine, the top envoy said Ali has been given a couple of days to pack and return from Islamabad. "The Palestine government has told Ali that he was not its envoy to Pakistan anymore," Haija said. The Palestinian Authority, meanwhile, described as "unintended mistake" but "not justified" the presence of its ambassador at the event attended by Saeed. "On the basis of the principled and firm Palestinian position, the Ministry of Foreign Affairs and Expatriates considered the participation of our Ambassador in Pakistan in a mass rally in solidarity with Jerusalem, held in Rawalpindi on Friday and in the presence of individuals accused of supporting terrorism is an unintended mistake, but not justified," a statement from the Palestinian Authority (PA) said. It described Palestine as a "real partner" of India in its war against terrorism and also expressed its appreciation for New Delhi's vote in favour of the resolution at the United Nations General Assembly (UNGA) on the issue of Jerusalem. Palestinian ambassador to Pakistan Ali reportedly attended the Difah-e-Pakistan Council- organised a rally in Liaquat Bagh in Rawalpindi on Friday. Difah-e-Pakistan Council is an association of religious and extremist groups in Pakistan, headed by Saeed.